While the benefits of solar panels are widely known, there are still a significant number of homeowners who believe them to be unattractive additions to a roof. The invention of solar roof tiles has provided a solution to this problem as they are installed as a seamless part of the roof, almost indistinguishable from standard roof tiles. But is it possible to find solar roof tiles in the UK? We’ve researched some of the leading manufacturers to find out what our options are, as well as an alternative to standard solar panels and solar tiles: in-roof or integrated solar. Simply put, there are 3 options when installing solar technology on your home: on-roof, in-roof or complete roof. On-roof is the most commonly seen in the UK, i.e. panels attached to a frame which is mounted on top of the roof. In-roof (a.k.a integrated solar) replaces a section of the roof so that the panels sit flush with the roof’s structure and are less visually obvious. A complete solar roof involves the installation of brand new roof made up of a combination of standard tiles and solar roof tiles. Solar roof tiles are small solar PV panels which absorb sunlight and generate electricity in exactly the same way. The key difference is that they look and perform just like normal roof tiles. The ratio of solar tile to standard tile depends how much power you need your solar roof to generate, but viewed from street level there should be very little visual difference between the 2 types of tile. Solar roofs can be installed as part of new builds or a roof replacement, but not integrated into existing roofs. Solar roof tiles are more widely available in the US but there are some options for UK homeowners looking for more attractive solar for their home. Tesla are the big, international name when it comes to solar roof tiles and it is possible to pre-order your solar roof from them now. With a deposit of £800 (which is fully refundable up until you confirm your purchase) you can secure yourself what they refer to as ‘beautiful solar for your home’. The first UK installations are due to begin in 2018, but Tesla has not yet confirmed exactly when. Made with tempered glass Reported to be 3 x stronger than standard roof tiles. Invisible Solar Cells Made up of glass tiles, solar and non-solar, but both appear the same from street level. 4 designs available The tiles are available in Textured, Smooth, Tuscan or Slate so you can choose the design which will complement your home’s architecture. Lifetime Manufacturer’s Warranty The solar roof tiles will last as roof structure for as long as your home lasts. 30 year warranty for power and weather damage The solar technology in the tiles will continue to generate power for at least 30 years and is guaranteed against weather damage for that time too. reduce your reliance on energy suppliers even further. Manage with Tesla App The Tesla app enables you to monitor all your Tesla technology and energy usage from your smart device including a Solar Roof, Powerwall or even a Tesla car (Model X or S). Cost is likely to be a barrier to many when it comes to the Tesla roof. On their website they give an example of a installing a solar roof on a typical home in Maryland at around $52,000. They have also outlined plans to offer financing in the U.S which should mean this option may also be available in the UK at some point. The company do concede that replacing a roof with their solar tiles will be more costly than a standard roof replacement, but that the money it will save you in ongoing energy bills and the value it will add to your home can balance this. British solar company, GB Sol, is based in Pontypridd, Wales, where they have been manufacturing solar panels for over 20 years. They are the only UK company we’ve found in our research offering a product to rival Tesla’s solar tiles, although their product is a solar slate. The GB Sol solar slate has been designed in natural blue to be installed alongside standard natural blue slates in a roof replacement or new build project. GB-Sol specialise in both one off installation and solar for housing developments. Each slate can produce 35W of power in ideal conditions and is covered by a 10 year product and power guarantee. MCS Accredited MCS is the industry mark of quality for renewable energy and heating systems. Lightweight at 3.5 kg per slate Each slate weighs less than a standard roof tile so the roof could be fitted to existing building with no increase in load or need for strengthening. This is a particularly attractive feature for listed buildings with delicate structures. Suitable for use in conservation areas / listed buildings / protected rural areas Each local planning authority will have their own rules but these slates were designed as an alternative solar solution for these scenarios. Can be installed by a standard roofing contractor The PV slates can be fitted just like normal slates, a solar electrician can complete the electrical installation afterwards. As these slates are complete roof replacement there are some restrictions on installation. They are not suitable for tile roofs and need to be installed on roofs with a minimum slope of 22° although above 30° is ideal. There is only one natural blue design currently available although they can be suitable for blacker roofs as they will darken naturally over time. British company Solarcentury used to offer a range of solar tiles called C21e but these are currently not on the market. At the moment they offer the Sunstation Roof-integrated+ in partnership with IKEA. In this system 6 solar panels are installed to sit flush with your existing roof for a more ‘seamless’ effect. If you’re not planning a complete roof replacement but on-roof traditional panels don’t appeal, both GB Sol and Solarcentury offer integrated or in-roof solar panels. Although these are not technically solar roof tiles – they clearly look like solar panels – they replace a section of the roof and so sit flush with the roof tiles. These are considered by some as a more attractive option than traditional panels and are both simpler and cheaper than a solar roof replacement. Find out more in What are Integrated Solar Panels? What’s the Cost of a Tesla or GB Sol Solar Roof? The cost of replacing your roof with solar tiles will depend on the size of your roof, the complexity of the installation and the ratio of solar tiles to non-solar tiles. It’s particularly difficult to estimate the cost of a Tesla solar roof as there have been no installations in the UK as yet and the Tesla website doesn’t give any detail. It is generally accepted that solar tiles are more costly than standard solar panels and that they aren’t as efficient at generating electricity, but for buildings with restricted planning permission or concerns about the aesthetics of solar panels. 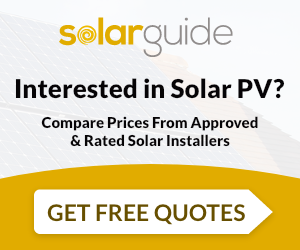 Whether it’s solar tiles, solar panels or both that you’re interested in, the best way to save money on the installation is to find and compare quotes from several installers. Here at Solar Guide we make finding quotes quick and hassle free. Simply send us an enquiry and we’ll find up to 3 MCS accredited solar installers in your area. Each will visit your home to assess your home’s suitability for solar and energy needs in order to recommend the best solution at a competitive price.